You may have heard me rave about our new Home Office already… because it is my dream office! We had the amazing opportunity to build this beautiful space from the ground up, exactly as we wanted it. So when I say this place is a dream come true, I mean it. From the light fixtures to the art on the wall, this place is truly us. And today, I’d like to take you on a virtual tour of some of my favorite spaces! Whether you’re a first-time guest or a member of our family who works here every day, I want everyone to be inspired from the moment the elevator doors open. Our lobby tells much about the story of who we are, including gallery walls we’ve built on either side of our reception. I worked with my design team to create snapshots of our design process, from hand sculpted designs to the finished product. 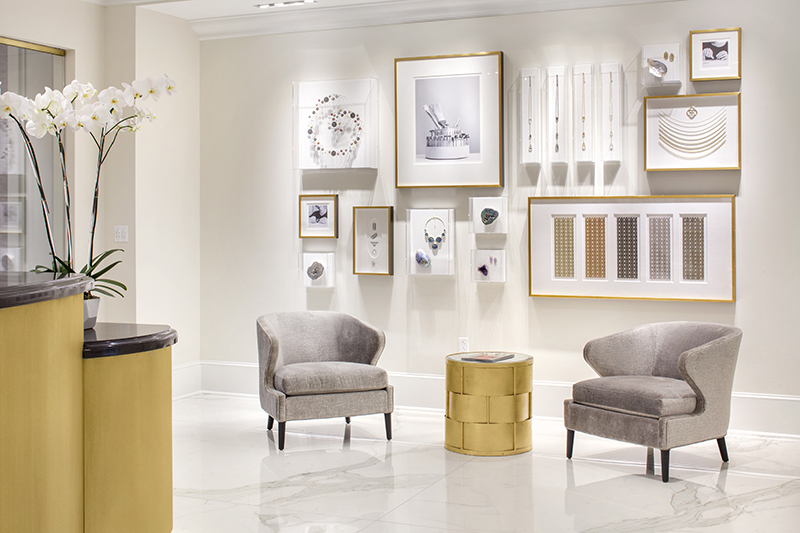 Welcome to the Kendra Scott Nail Bar! This is another of my favorite features of our office. We offer complimentary manicures and pedicures 5 days a week – using our KS Nail Lacquer, of course! One easy way to make a Monday meeting more fun? Schedule a meeting over manis! Each of our conference rooms is inspired by and named after one of our gemstones. The stone chandeliers were hand made in our own design studio using real stones, and everything from the paint on the walls to the fabric on the chairs was carefully chosen to reflect the color and energy of that gemstone. Our most popular room, you ask? Rose Quartz! I have so many favorite spaces in this office, but this one tops my list for the moment. When I set out to create our new design studio, I wanted to pull out all the stops. We have grown so much from where we started – piecing jewelry together in the 10x10 spare bedroom of my house. And I wanted to celebrate that growth by creating a top-of-the-line design studio. My favorite piece of equipment is our 3D printer. I placed it purposefully next to the first piece of equipment we ever bought for ourselves, over ten years ago. (We saved for months and sold scrap metal to afford it.) Seeing those two machines side by side is a constant reminder of how far we’ve come on this crazy journey.